Slide your back down the wall by slowly bending your knees. Don't let your knees go past your toes. Let the knees point in the same direction as your toes. As you come up, focus on tensing the muscle above your knee and your buttocks. Tip: don't bend forwards or stick your buttocks out. You should feel the stretch along your outer right thigh and hip. Lower yourself by bending your knees to no more than a right angle. Keep your back straight and don't let your knees go past your toes. 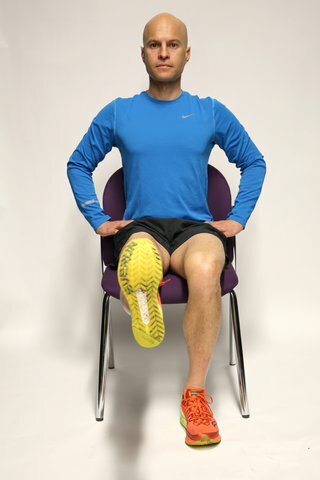 Now bend your right leg and slowly lower yourself, making sure your knee doesn't go past your foot or lean inwards. Push back up slowly to your starting position. Tip: don't let your knees extend over your toes. 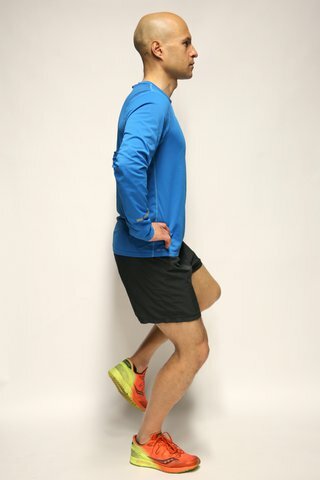 Slowly bend the knees, lowering into a lunge until the right leg is nearly at a right angle. Keeping the weight on your heels, push back up to the starting position. 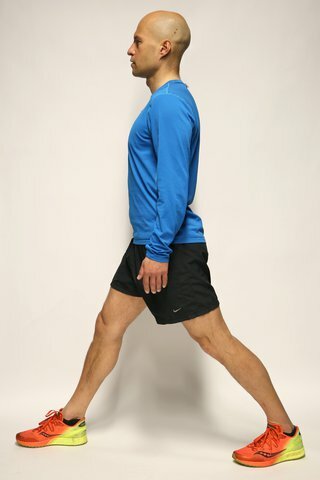 Keep your back straight and don't let your knees extend over your toes.